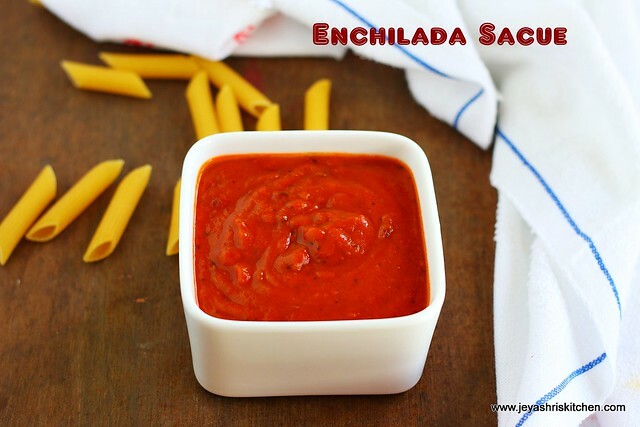 Enchilada sauce is used in many Mexican recipes like burrito, quesadilla and Mexican rice. It can be used as a sauce for pasta too. Today i am sharing the recipe of the Enchilada sauce which i used for the Mexican fried rice. I did this for the cookery show which i did for the Mother's day last week. The Vietnamese rolls, the mexican rice with enchilada sauce was a huge hit in the show. The recipe of Mexican fried rice will be coming up next on jeyashri's kitchen. Chop the onions roughly. In a pan add 1 tblsp of oil and cook the onions and the garlic pods till it becomes nice golden brown. Alternatively you can use onion powder and garlic powder available in super markets. If you have the powders skip the first step and go ahead with grinding. Once it is done switch off the flame and add the tomato puree (if your tomatoes are nice ripe and red in colour add 3 tomaotes) cumin seeds, red chili powder,herbs and oregano. Add little salt. Once the mixture is cool grind this into a fine paste. In the pan add 1 tblsp of olive oil and add the plain flour to this. Cook for 2 minutes and add the ground paste to this. Add water to reach a saucy consistency. Add pepper powder and brown sugar. Boil this for 2 minutes and switch it off. If using for the rice, burrito or quesadilla, do not add more water. Let this be like a thick sauce. If using for pasta let be little thinner. Switch off the flame and add few lemon juice. Home made enchilada sauce is ready. This can be stored in clean air tight container and stored in the refrigerator for 3-4 days. This sauce can be used for making pasta too. Keep it refrigerated for 3-4 days in a clean jar. 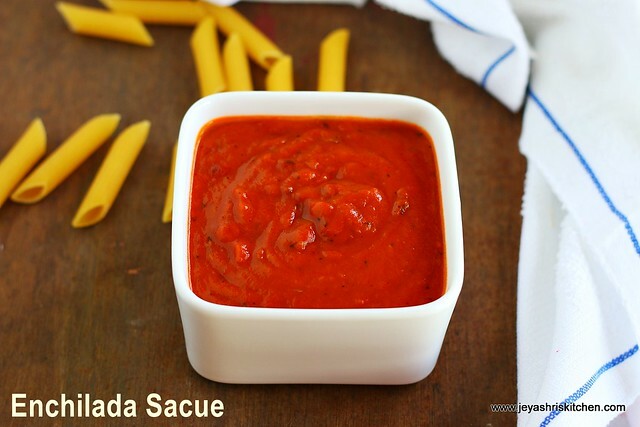 You can use ripe red tomatoes instead of store bought tomato puree.